Like many cities, the weather in Charlotte can change drastically from one day to the next, but its weather is typically mild for most of the year. This is largely due to its location over 100 miles from the Atlantic Ocean and just 30 miles from the foothills of the Appalachian, both of which create and influence unique climates and weather patterns across the region. While Charlotte sees an average overall high temperature of 71 degrees Fahrenheit and an average low temperature of 49, winter months usually bring temperatures in the 30 to 60-degree range, while summers see 60 to 90 degrees Fahrenheit. Additionally, while August may be the rainiest month of the year at just over 4.2 inches total accumulation, Charlotte sees around three to four inches of rain per month year-round. No matter what time of the year you plan to visit Charlotte, though, you should be sure to check current weather forecasts so you can better prepare by knowing what to expect in terms of precipitation, humidity, and temperature. Also, since extreme weather has been known to occur throughout the region, having the most up-to-date information can help keep you and your family safe during your travels. 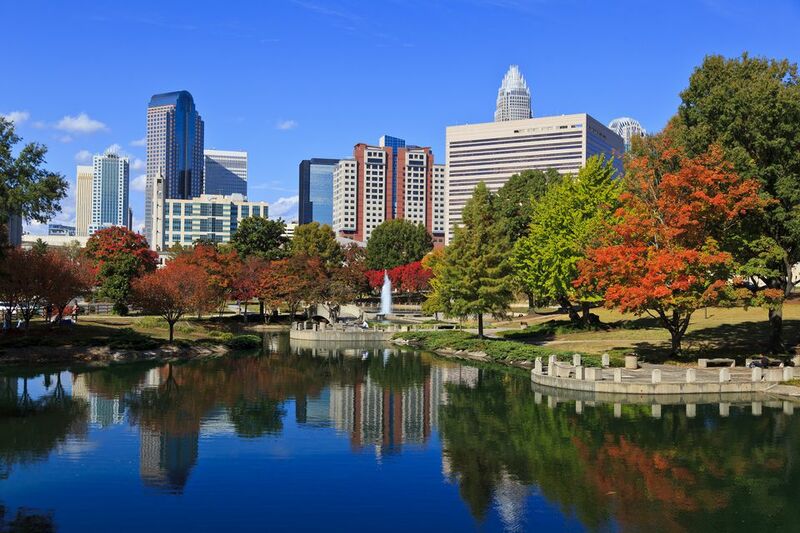 On average, spring is one of the best times to visit Charlotte, especially the later in the season you can plan your trip. While March starts out with a chilly high of 59 degrees Fahrenheit, the city warms up by the end of May to a pleasant average high of 81 degrees. Meanwhile, the low averages range from 39 to 62, meaning you won't likely experience frigid temperatures, especially in April and May. Still, you should be prepared for rain throughout the season since each month experiences roughly seven to 10 days of rainfall—with the most occurring in April and May. What to pack: If you're visiting in March or April, you'll definitely want to bring a raincoat and waterproof shoes, especially if you plan to enjoy any outdoor activities like hiking. You should also bring a variety of layers to accommodate the steadily rising temperatures throughout spring — pack fewer warm items the later in the season you travel. Summertime means plenty of outdoor activities and events and the arrival of warmer weather to the region, with high temperatures averaging 87 degrees Fahrenheit and average lows averaging 66 for most of the season. While not too hot, the summer in Charlotte can be brutally muggy, especially in the middle of July when both the humidity and temperature reach their peak. Unfortunately, muggy days also mean muggy nights because the dew point keeps humidity levels from dropping even as the temperatures do. What to pack: Due to the increased humidity of the summer, you won't likely have a need for a jacket or sweater at night, despite the temperatures dropping around 20 degrees from dusk to dawn. Instead, pack light, breathable articles of clothing like tank tops, short-sleeved shirts, shorts, and open-toed shoes. You can also bring your swimming gear if you want to head to an area pool or swimming hole nearby. The mugginess of summer continues well into fall, finally tapering out around mid-October when colder weather finally settles over the region; however, precipitation stays relatively normal throughout the season with each month receiving about 3.3 inches of rainfall. Also, as summer draws to a close, the end of September sees high temperatures in the upper 70s and lower 80s, which steadily fall to a high of around 59 degrees Fahrenheit at the end of November. Meanwhile, average lows range from 60 degrees Fahrenheit in September down to 32 at the start of December. What to pack: You won't need to pack a jacket until at least mid-October, but you may want to bring a light sweater or pullover in case of a sudden cold front. Otherwise, a variety of clothing ranging from long-sleeved shirts and pants to short-sleeved shirts and shorts are a good idea to keep you comfortable during your travels. While Charlotte may not be known as a winter wonderland destination, it still experiences seasonal lows and small but consistent accumulations of snow from December through March each year. However, with an average of one-tenth of an inch of snowfall each month — and the most falling from late January to late February (0.3 inches) — the city isn't ideal for winter or snow sports. Fortunately, there are plenty of great festive events throughout the season, and the average temperature stays roughly between a high of 63 degrees Fahrenheit and a low of 30. What to pack: While it may not be as cold as some northern states (or further inland in the mountains), you'll still need to pack for winter-like conditions most of the season. You should bring clothing you can layer — which ranges from a light T-shirt to a heavy sweater and coat — as well as things you can wear on the occasional hot, sunny winter day. Charlotte has seen its share of extremes, though, with the hottest temperature ever recorded at 104 degrees and the coldest at -5—both of which have occurred several times throughout the city's history. In terms of precipitation, the most rain in one day in Charlotte is 6.88 inches, which fell on July 23, 1997, and the most snowfall in one day (14 inches) fell on February 15, 1902. The earliest snowfall ever in Charlotte was on Halloween, October 31, 1887, when just a trace was recorded, and there has also been a trace of snowfall on several days in early November, but the earliest accumulated snow in Charlotte was 1.7 inches on Nov. 11, 1968. The strongest or fastest wind speed in Charlotte would be attributed to Hurricane Hugo on September 22, 1989, when a gust of 99 miles per hour and sustained winds of 69 miles per hour were recorded at the Charlotte-Douglas International Airport. Per the criteria of what qualifies as a hurricane, Hugo sustained hurricane-strength winds until shortly after it passed west of Charlotte. While Charlotte's winters are occasionally snowy and cold, the rest of the seasons are generally mild if not slightly wet year-round, with summer temperatures remaining relatively cool and fall chills remaining relatively warm. Additionally, the number of daylight hours fluctuate throughout the year, with winter and spring getting the fewest hours of sunshine.